Would You Like Your Child to Express Themselves Clearly and with Confidence? We run fun, lively and creative classes to help children and young people to find their own unique style of self expression. This helps them to lead and build confident, relaxed, happy lives. Emma Coogan School of Speech and Drama opened in October 2004 and we still have students with us from our very first year! 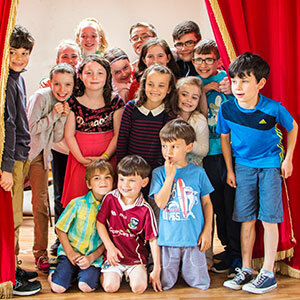 We are committed to providing a high quality standard of speech and drama training for all ages, from 4 years to teaching diploma at Fellowship level. We are passionate about what we do and share that passion with our students, which is reflected in our performances and in the feedback we receive from parents, audiences, adjudicators and examiners. 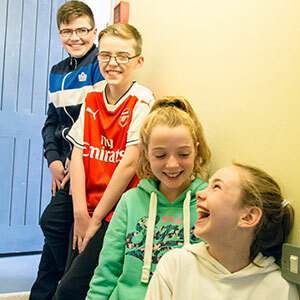 While learning and developing a whole range of techniques, students develop their personality, interact with their peers, enjoy new skills and most of all have lots of fun, in a lively and creative environment. Our students gain a confidence, that will carry and support them throughout their lives. I love to see the children skip with joy in and out of drama class. The children all agree they LOVE their teacher Emma. The children also love the games and participation in the Feis Maitiu and the end of year show. The class is well run and structured and every child has an opportunity to be involved in the class. 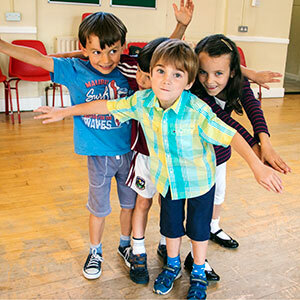 Many different aspects of speech and drama are covered and it is always conducted in a relaxed, happy atmosphere. And of course, Emma has a lovely way with the children and they couldn’t be in better hands! Maria – parent of 11 year old student. I’ve decided to send Emilie (9) to drama and speech classes firstly because I’m a big drama fan myself and thought it would help her to boost her confidence (as she can be shy at times) in artistic and creative environment. And I am happy indeed with the choice I’ve made as Emilie loved each class. She became much more confident and it’s a great place to encourage her creativity. Emilie attended Classes for three years in a row and one summer camp. She finds the end of the year shows very rewarding and the RIAM exams..really a great challenge. I would highly recommend Emma’s classes as she is very dedicated and committed to her work and kids. I can see great improvement in Emilie’s confidence and the best part – she loves drama! I would highly recommend the classes to a friend. There is a lovely atmosphere there and they always come out smiling. It is a great relaxed way to improve a child’s confidence and there is no pressure on them at any stage. They are gently encouraged to reach their potential. …..really fun and challenging exercises to help you get into character. Emma is encouraging and fun. Want Some More Drama In Your Life? Sign up to our newsletter to keep up to date on our classes and fun events.